Some of the people who marched from Jarrow to London in October 1936. Just as it was in the 1920s, the world economy is today undergoing problems. If you've seen the news over the past few years, you've more than once probably seen people protesting either outside Government Buildings in Dublin or Downing Street in London, or you might be more familiar with the Occupy movement which sprung up in various cities in 2011. Demonstrations like these are not new. 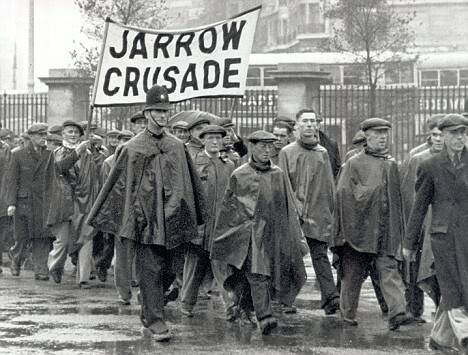 Back in 1936, thousands of people from the northern English town of Jarrow signed a petition and took part in a march from their town to London to demand government assistance for their depressed area. Where was it? What did it suffer from? What were its problems? 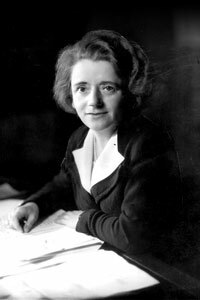 Jarrow Borough Council, Ellen Wilkinson MP. Petition requesting the government to provide industry to the town. Signed by 11,000 people. 200 men selected to march. Why was it called a Crusade? Mouth organ band, transport van, town halls. Wilkinson at the Labour Party Conference. The shock waiting for the marchers when they got home. J.M. Keynes, those who took part in the Jarrow March, Winston Churchill? 2007: What were the causes and consequences of the Jarrow March, October, 1936? A brief YouTube video showing original footage of the march, the petition being read out, and the official response of the government. The original Guardian story from 1936 reporting as the Jarrow marchers reached Harrogate, roughly a third of the way to London. The last surviving member of the Jarrow March, Cornelius Whalen, died in 2003 aged 93. The BBC's overview of the march and the circumstances that caused it. A biography of the Labour MP for Jarrow.